Interesting passage. God, who is wise, decided that we couldn’t know Him through wisdom. None of us has the wisdom to understand God. It just ain’t gonna happen. Instead, He chose that we would come to know Him through the foolishness of the proclamation. This is the proclamation and I’m the foolish proclaimer. For anyone to think that I, or any other preacher, has the wisdom to explain God to you IS a fool. Sadly, many of us who take it upon ourselves to proclaim the Gospel DO think we’re wise. When we try to show off our wisdom, we usually come off looking like fools. Someone once said that the only way to understand God is to admit that you don’t understand Him. That, ladies and gentlemen, is a fact. A lot of people look for God in books. There’s nothing wrong with that. Of course He’s in books. The trouble is that there’s only one book that tells the whole story. Everything else is just human beings trying to use their so-called “wisdom” to explain the unexplainable. I can’t explain the gifts that I’ve received in my life any more than I can explain how a giant oak tree grows out of a tiny acorn. I can’t explain why God would choose to send His Son to die on a cross to save you and me from our sins any more than I can explain why the earth revolves around the sun. Some things just ARE. You believe them because of your own experience, or you believe them because you have faith. I’ve never gone around the world. But I believe it can be done because others have done it and shared their experiences with us. I can’t prove that the sun will come up tomorrow. But I’ve personally seen it come up every morning for more than 22,000 days so I’m pretty sure it will come up tomorrow too. Wait, let me correct that. I’ve personally only seen the sun come up a few times. But I’ve gone to bed when it was dark and it was light when I got up. I’ve seen the sun SET more than 22,000 times. Anyway, true wisdom lies in knowing that we’re not that wise. We have great respect for the Albert Einsteins and the Steven Hawkings of the world. But compared to God, those guys are idiots. 21st Sunday of Ordinary Time–Are You Someone’s Angel? This was my homily for Sunday, August 22, 2010. Sorry for the late posting. You and I are bombarded every day with information. We have hundreds of stations on cable and satellite TV. Having to fill all that TV time, networks dredge up every possible bit of “news” whether it’s really worthy of or attention or not. Networks like CNN and Fox not only offer 24 hours of sound and pictures, they even scroll continuous news as text across the bottom of the screen. During the day, they add stock prices to the screen. It’s almost impossible to keep up. Movie theaters demand quantity rather than quality to keep their ten-screen megaplexes full while HBO and Showtime wait to get their piece of the pie from the same movies when they’ve run their course on the big screens, often in a matter of weeks. Blockbuster and Netflix also have to satisfy their customers. Some of us remember when a new movie would come out at one of the big movie houses downtown or on Grand Avenue. After several weeks they would move to the second-run theaters for a few more weeks. Then after six months or even a year, they would show up on network TV. There were a lot fewer new movies then, but the quality was much better. Then there’s the Internet. As I was getting this homily ready Friday (last) night, the tornado siren went off. With a couple of clicks I was able to look at the radar on my computer screen and read the tornado warning. Jan was at a movie so I sent her a text message. That’s modern technology. There’s Facebook and MySpace, Twitter and YouTube so we can keep in constant contact with our friends and total strangers who we call friends because we’re connected over the web. I hear daily from people in England, Ireland, Canada, Australia, and all over the United States, some of whom I’ve actually met and some I’ve never met and probably never will. But I can tell you what’s going on with them and they know what’s going on with me. There are blogs and podcasts and online forums on just about any subject you can think of and a lot that you would never think of. It’s all out there. Don’t get me wrong. I love using the web to stay in contact with these people. My granddaughter in Huntsville, AL is just two weeks old but Jan and I have been able to see her on live video three times already. We’ll get to meet her in person in a couple of weeks, but the video chat is much better than waiting for still pictures to come in the mail. In fact, we already have more than a hundred pictures of her that her mom and dad have sent us online. Plus theres regular TV and the radio, newspapers and magazines, and good old fashioned US Mail to keep us informed. Sometimes, it’s just too much! We try so hard to stay on top of all this information that sometimes we forget the things that are really important, like family and friends, spiritual reading, prayer, and old-fashioned peace and quiet. One thing I’ve noticed about all this stuff, is that family values and spiritual values are hardly ever mentioned. Christianity is a taboo subject unless someone wants to make fun of it. It’s not politically correct to talk about Jesus, or the Ten Commandments, unless the story is about some atheist suing some town council to get a Nativity scene removed from some public place. It’s OK for the Muslims to build a mosque near Ground Zero in New York, but a Christian church in the same neighborhood, that was there before 911 can’t get permission to rebuild. One thing I’ve noticed in this flood of words and pictures is that no one ever mentions hell. We’re being sold on the idea that the place just doesn’t exist anymore. Live, drink, and be merry. Tomorrow will take care of itself. There’s no need to worry about the consequences of our actions. Personal responsibility is a thing of the past. On the other hand, there is a heaven. But we don’t have to live a good life, or even die to get there. Drive the right car, drink the right brand of liquor, wear the right blue jeans, and take the right little pill and heaven is yours, right here on earth. You and I know, deep in our hearts that none of this is true. But when you’re bombarded with these messages hundreds of times a day, it’s hard to resist these promises. None of us expects to die anytime soon so why not enjoy this life here and now and worry about the next life later? A nice seven day cruise, maybe to the Caribbean, lots of Captain Morgan rum, a new wardrobe, all the food, fun, and hot bodies we can handle. What could be wrong with that? Or, like the commercial says, “What happens in Vegas stays in Vegas” It’s the new “adult summer camp”, isn’t it. Imagine how hard it must be for our brothers and sisters who don’t have a solid faith in Jesus. After all, He was just a guy who lived half way around the world 2,000 years ago. Why should I believe Him when all my friends are living la vida loca. That’s a great analogy. What makes it ever better is that you will never meet a more humble man that Robert Hermann. If he needs Christ’s help to get through the narrow gate, where does that leave you and me? I had some experience with Jesus’ ego-deflating help just this week. 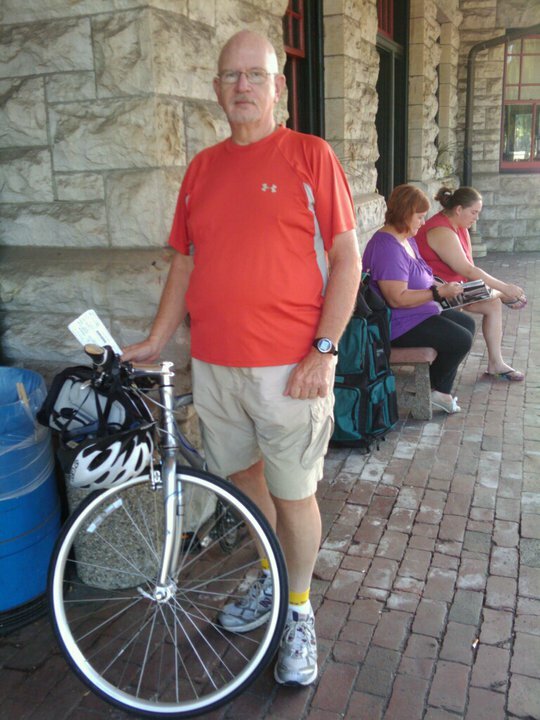 On Tuesday morning I took a train to Jefferson City and rode my bike back to Saint Charles on the Katy Trail. Face it, I’m not the finest physical specimen you’ve ever met. I’m about 20 pounds overweight and I’m just weeks away from getting my first Social Security check. But with God’s help, I made the trip back in three days. It’s 122.4 miles from the current state capitol to the first state capitol, but who’s counting? Anyway, I was almost back, about ten miles from the finish line and I was feeling pretty good about myself. I may not look like like much, but I could never done such a thing ten years ago, probably never in my life. Thanks be to God, I was about to reach my goal. I stopped in one of the few shady spots in the last twenty miles or so to rest for a minute and I met two young guys going the other way on the trail. They were in the process of riding from Cleveland to California. They’re riding 100 miles per day for almost two months! So much for my inflated ego. I have to tell you about another person who may be a personal angel for me. I ride two or three times a week on Grant’s Trail. Every single time I ride, I see this guy. I don’t ride every day, but every time I do ride I see him, so he must ride every day. He obviously has lost the use of his legs. He has a recumbent bike that he pedals with his arms. I’ve seen him get ready to ride. He gets out of his car into a wheel chair. He wheels himself to the back of his car where he gets the bike off the rack, chains his wheel chair to the back of his car, then heads off down the trail. The effort it takes him just to get ready to ride would be too much for me. But there he is, every day, doing his thing. That’s discipline. Seeing his determination makes whatever I accomplish with two arms and two legs pale by comparison. Talk about discipline. Jesus tells us we have to be strong to get into heaven. To be strong you must have discipline. Jesus is the source of our discipline and our strength. In spite of what some people think, in spite of what society would have us believe, there’s no free lunch. We have to work hard, endure the trials, whether they’re from outside, or self-inflicted like my bike trip. Some people are blessed with great natural gifts. Some of us, not so much. But with proper discipline, we’ll all be good stewards of the gifts that God has given us, and we’ll welcome the discipline He gives us, knowing that it will make us stronger; make us more able to enter through that narrow gate. 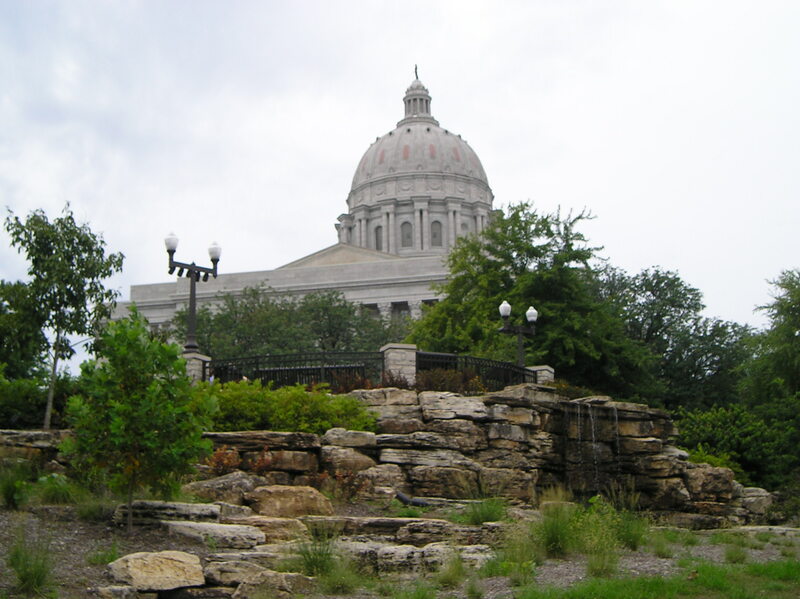 As promised, here’s a post-mortum on my grand adventure on 2 wheels from Jefferson City, MO to Saint Charles. It was definitely an interesting trip. Some of it was about what I expected but there were some surprises too. I left Saint Louis (actually Kirkwood, a suburb) at 9:00 am Tuesday. The ticket said 8:59, go figure. Like they could really be that specific? Anyway, the Amtrak train was the first surprise. I haven’t been on a train since I was a teenager so I wasn’t quite sure what to expect. It was very nice. The train itself was clean and pleasant. There was a cafe car with drinks and snacks. The seats are comfortable and the ride as smooth as glass. It was a short two-hour ride. along made the bike very unstable. Rather than roll backwards down the hill and into the Missouri River, I decided that it would be best to start my actual ride on level ground. This part didn’t count anyway. 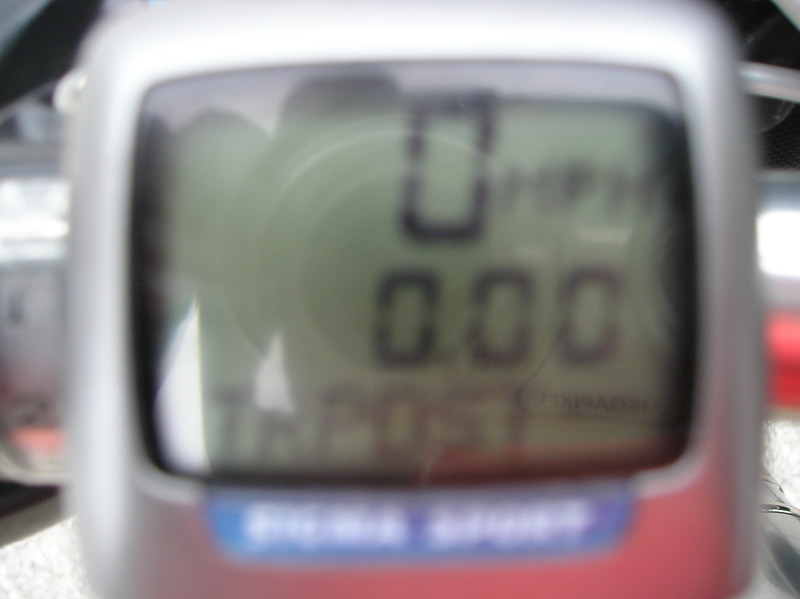 I zeroed my odometer when I was standing in front of the actual capitol. After a very good cheeseburger at the Downtown Diner, the actual ride started a little after noon. I ran into the first problem less than a mile into the ride. 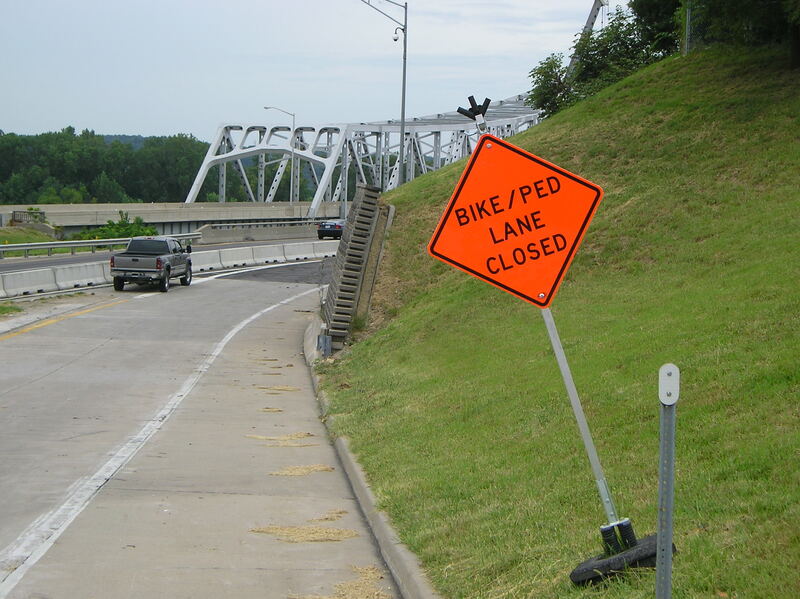 The bike lane on the Missouri River bridge was closed. Fortunately, the workers who had the lane closed were eating lunch and I was able to navigate around their giant crane, avoiding the life-threatening possibility of crossing the bridge in traffic. It’s a little over 2 miles from Jeff to the actual trail. Once I got to the trail, I felt a lot like the Maytag repairman. For the first 80 miles or so, I saw three people. I saw two girls riding about ten minutes into the trail and one gentleman in a dress shirt riding a balloon-tired Schwinn on Wednesday, apparently a local. Otherwise, it was just God, me, and the frogs. That was another strange thing. I expected to see some wildlife, especially since there were no other people. But the only animals I really saw were a lot of frogs hopping across the trail. That first day was uneventful, except for breaking a spoke. As per my master plan, or dumb luck with some help from the Holy Spirit, I made it to a small town called Bluffton around 4:00 where I planned to spend the night at the Steamboat Junction Campground. Let me tell you about the Steamboat Junction Campground. First, it’s very nice. Everything was clean, the sites were nice, and there wasn’t a soul in the place. No other campers. No owners. Just me. There’s a box where you put your camping fee. There’s a refrigerator stocked with soda, water, and some snacks. Again, you put your money in the slot. I have to say, I’ve camped many a night in my life, but never completely alone. Trust me, I was zipped up in my tent before it got dark. It’s amazing how many noises there are in the woods when you’re the only one there. Dinner Tuesday night was a celophane-wrapped sub sandwich from the honor-system fridge, some beef jerky, and a granola bar. I survived the night, enjoyed more beef jerky and another granola bar for breakfast and headed out for day 2. 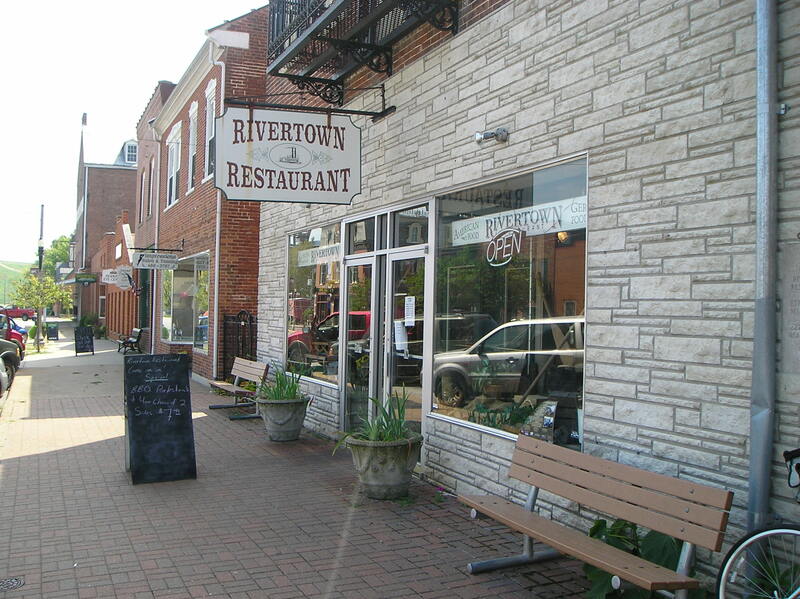 The highlight of day 2, at least the first half of day 2, was lunch in Hermann, MO. Hermann is a town of German heritage which is known for its wineries, about two miles off the Katy Trail. Since it was before noon and since an unstable rider and an unstable ride is a bad combination, I settled for a barbecued pork steak, took some pictures, and was on my way. 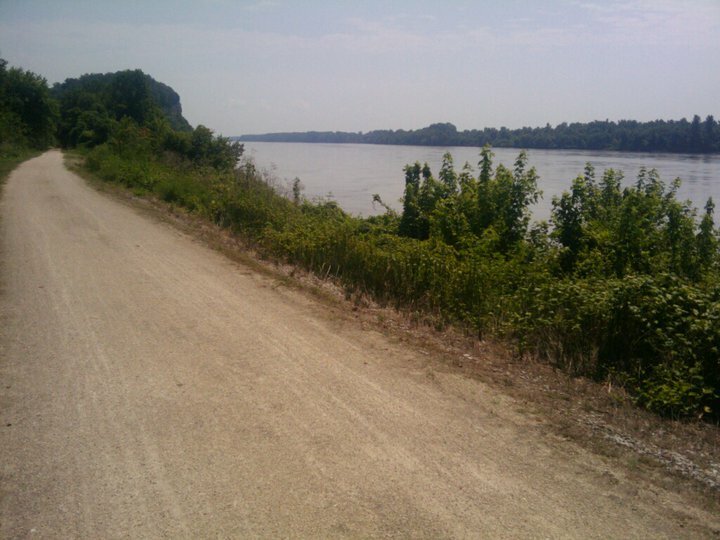 The Katy Trail is a combination of wooded scenery, magnificent views of the Missouri River, sometimes just a few feet away, high bluffs, and a lot of small towns that have seen better days. The trail is the former right-of-way of the MKT Railroad. 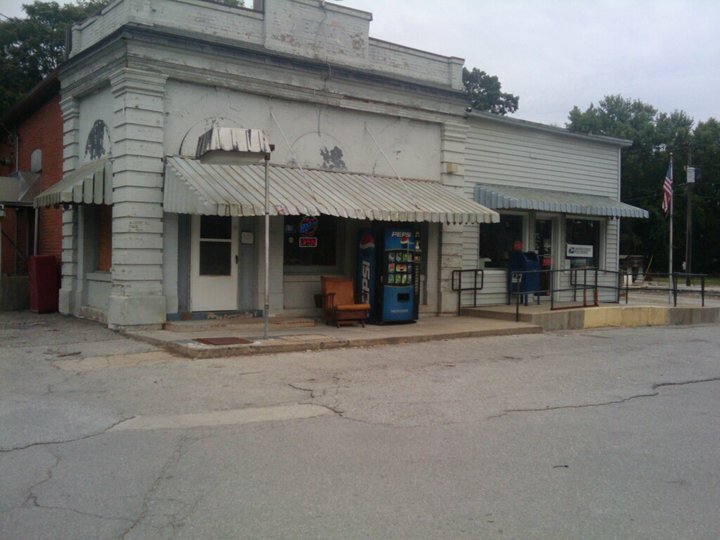 In the railroads’ hey day, small towns sprang up along its path. When the railroad left, so did the people leaving in their wake some sad little towns. I’m sure trail users generate a little revenue, mostly on the weekends, but there’s really not much going on there. I had hoped I might be able to find a daily mass along the trail, but churches are few and far between. So, the conversations I had with God were one-on-one. 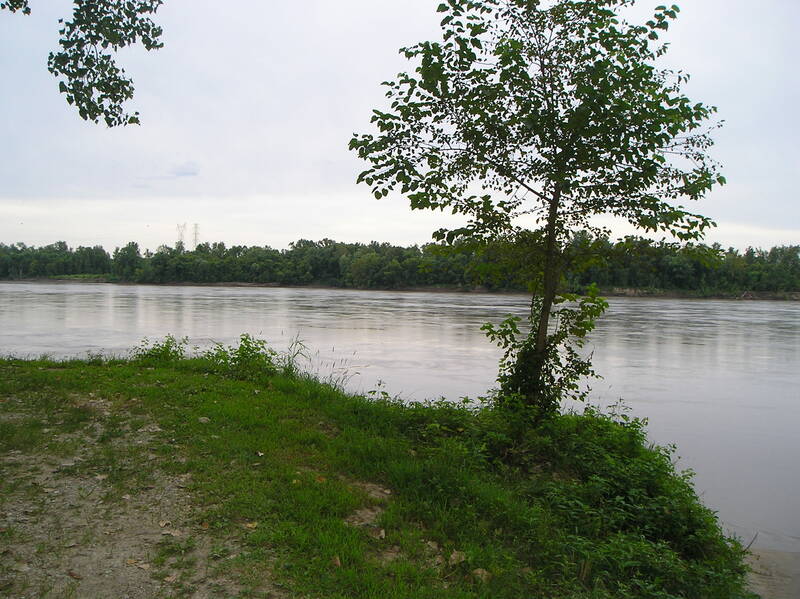 But, you can’t look at a hundred-foot-high bluff that was carved by just water, or the mighty Missouri River making it’s way to it’s meeting with the Mississippi, to realize the might and power of God. Then a butterfly landed on my hand at one point and stayed there for several minutes. God’s existence is all around us in the biggest and the smallest things. I had planned on spending Wednesday night in the town of Marthasville. Unfortunately, the campground where I planned on staying is now an overgrown field. Plan B was a nearby bed and breakfast. Good news-it’s still open. Bad news-there was no one there. I stopped and enjoyed an ice cream sundae, the highlight of the second half of the day, sitting in the shade. Lovely! 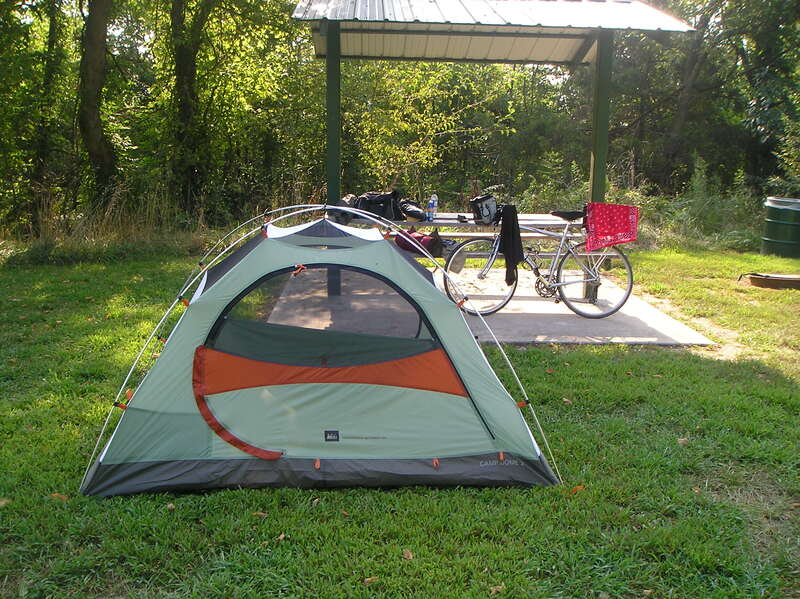 But time marches on, so I got out my trusty Katy Trail guide and saw that the next possible camping site was in Augusta, another eleven miles. Oh well, more miles Wednesday meant fewer miles Thursday. Klondike Park in Augusta is a beautiful spot. 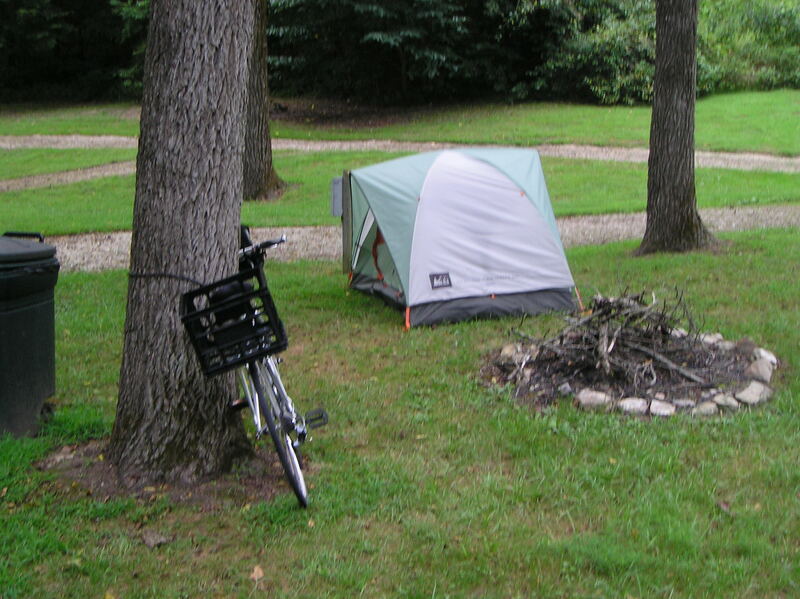 It’s a rarity in these parts, a campground in a county park. Again, it was almost deserted. There was another couple camped there, but I didn’t run into them until Thursday morning. It was another honor-system facility with nice sites and an excellent shower/bathroom building right across the road from where I camped. There wasn’t even a vending machine here so Wednesday dinner and Thursday breakfast were my new favorite beef jerky/granola bar combo plate, washed down with warm water. Yum! I may start a franchise. Heading into the home stretch now with a short day thanks to my overly-long Wednesday ride of more than 55 miles (the longest I’ve ever ridden in one day), I was anxious to get this thing over with. The only stop along the way was a biker bar (not the pedaling kind of biker, the Harley kind) in Defiance, where I enjoyed probably the best diet cola I’ve ever had along with a large ice water in the air conditioning. The nice lady behind the bar filled my soda bottle with water and gave me a cup of ice for the final leg of the journey. Defiance is the former home of Daniel Boone and a side trip was an option. But, the air conditioned bar won out. I can drive out to Defiance some other day. from Defiance to Saint Charles is mostly in the sun, so in spite of being the shortest leg of the trip, the combination of the heat and my worn out body made it the toughest. But the end was in sight and there was no way I wasn’t going to finish. There were actually other people riding on this stretch of the trail. In fact, I met two young men who were on their way from Cleveland, OH to California. They were planning to average 100 miles per day. Just what California needs, two more crazy people! 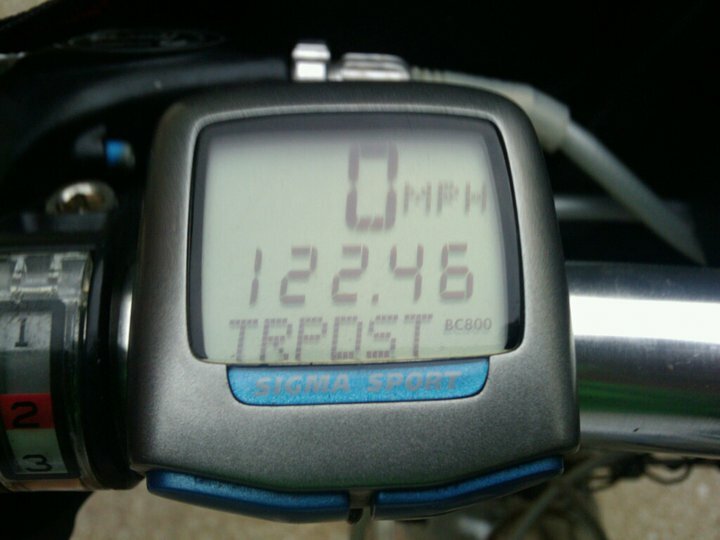 Seriously, I can’t imagine the conditioning and the stamina it must take to ride a bicycle that long and that far. Just as I was beginning to feel pretty good about myself, these young men reminded me that we all do what’s within our capabilities and not to get an inflated ego over my “accomplishment”. We don’t do anything by ourselves, whether it’s some kind of physical effort, mental effort, of spiritual effort. I’ll never be able to do what those young guys are doing, mostly because I’m not young anymore. On the other hand, I wouldn’t have been able to do what I did this week when I was their age either. As my wife pointed out to me yesterday at breakfast, I’m no great physical specimen but I’m in better shape now than I was in my twenties. We all have to do the best we can with what we’ve got. I’d say that’s the number one lesson I learned this week. Here are the others, in no particular order. 1. ALWAYS CALL AHEAD. The campground that was open last year may be a vacant lot this year. 2. Everything weighs more than you think it does. Everything is farther than you think it is. Everything takes longer than you think it will. 3. Never, never, never take ice water for granted. 4. Everything is possible with God’s help. If you’re interested, I’ve posted all my trip pix on my Facebook page. 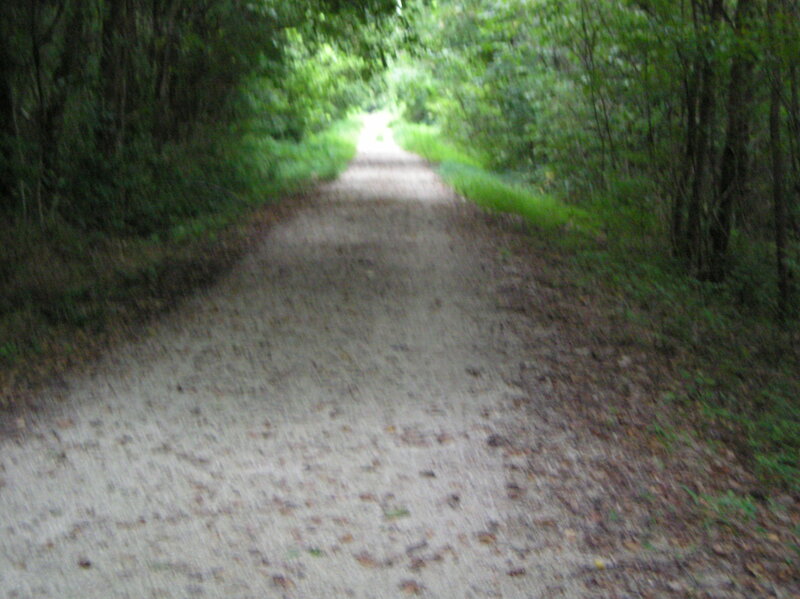 There are a number of good resources if you’d like to consider a Katy Trail trip. 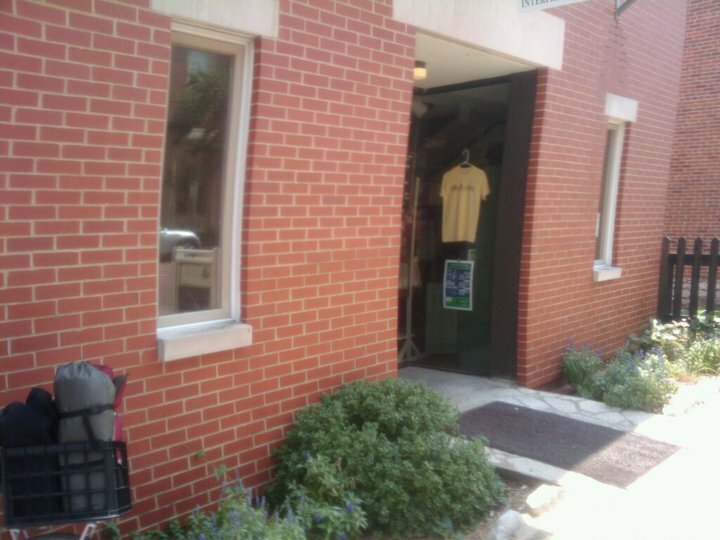 Probably the most useful is RideKatyTrail.com. Brett Dufur’s Katy Trail Guide Book is also well worth looking into. Today’s Gospel reading contains a key passage for our Catholic faith. Jesus gives His apostles the power to forgive sins on His behalf; the sacrament of reconciliation. What an awesome gift! Face it, we’re all sinners. We can’t help it. We’re born that way. We’re all burdened with original sin and a tendency to commit sins if we’re not careful. No matter how good our intentions, we just can’t be 100% sin free. Only one human being has ever been sin-free and we venerate her as the Mother of God. You and me…not so much. But there’s good news and bad news and more good news. The good news is that we can pay a visit to the confessional and be washed clean of our sins. God gave this power to His apostles and their successors. Father Gary, just like every priest in the world, can forgive us of our sinfulness. We’re washed clean, ready to start with a clean slate. The bad news is that we all know that our state of grace is only temporary because we’re going to sin again. More good news is that we can come back again and be forgiven again. As much as we’re prone to sin, God has more forgiveness than we have sinfulness. Like I said, it’s a great gift. I know I’m preaching to the choir here, but don’t be a stranger to the confessional. Far from being the scary place that we might imagine it to be, it’s there for us to visit often, to confess our sins and to have them washed away. The days of the fire and brimstone priest are long gone. There’s nothing that our priests haven’t heard before and they’re not going to condemn you for being human. Check it out if you haven’t been in a while. for God loves a cheerful giver.o be in sort of a rut here. We’ve all heard that money is the root of all evil. But that’s not what the scripture says. The actual quote is that the LOVE OF MONEY is the root of all evil. The First Commandment tells us that we should have no false Gods. For some people, money is a God. It’s the focus of their entire lives, certainly more important to them than God Himself. That’s a sin. Making a nice living for yourself and giving what’s left over to charity is something else altogether. I’m not going to pretend to know what’s in anyone’s heart. That’s between each of us and our Creator. But we all know examples of wealthy people who are more than generous with their money. Here in Saint Louis the Taylor family who own Enterprise Rent-a-Car come to mind and there are many others. It’s very important for you and I to support worthy causes, like the Annual Catholic Appeal. It all adds up. But each year the campaign kicks off with hundreds of thousands of dollars contributed by some of our wealthiest neighbors. On a national level, some of our richest Americans give huge amounts to charity. Warren Buffett, Bill Gates, and other wealthy folks have pledged to give half of everything they earn to those less fortunate. That’s billions of dollars to help solve some of our society’s biggest problems. Just between you and me, here’s a little secret. My former pastor used to say that God can never be outdone in generosity. Make it a habit to be generous to others and God will repay you, both in this life and the next. Try it. It really works. But remember, it’s a circle. When you find yourself being rewarded for your generosity, you have to share that reward too. Giving and getting; giving and getting. It’s a great feeling. No, money isn’t the root of all evil for those who recognize it for what it is and for who makes it possible for them to earn it. I’ve never seen a U-Haul trailer on the back of a hearse. We can’t take it with us so it just makes good sense for us to share what we have with those who don’t have so much. Not to get too political here, but it’s called “Christian charity.” It’s a virtue as long as it’s done by you and me. When the government tries to step in, that’s when things tend to go wrong.